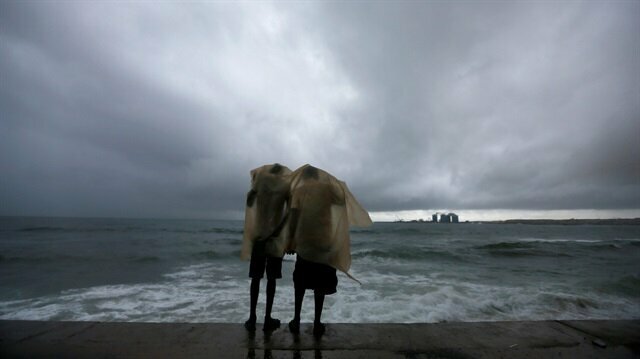 Two men use a plastic sheet to protect themselves from heavy monsoon rain as they stand by the sea in Colombo, Sri Lanka May 17, 2018. The centre's spokesman, Pradeep Kodippili, said flooding has forced the evacuation of people in areas where several rivers are overflowing, while four districts are on "red alert" for possible landslides. "People in those four districts have been cautioned to be vigilant," Kodippili told Reuters. Heavy monsoon rains in Sri Lanka have killed five people, prompting authorities to warn against landslides and floods in low-lying areas after spill gates had to be opened across the Indian Ocean Island. Lightning killed three people, a landslide a fourth, and the fifth death was the result of a fallen tree.